This is one of those things that I can’t believe is happening right here in our neighborhood. First of all, have you seen the documentary Genghis Blues? It’s about a blind bluesman from San Francisco named Paul Pena who taught himself how to Tuvan throat sing from scratchy cassettes that he recorded from his radio. His obsession eventually brought him to Tuva where he participated in their annual festival and befriended the best throat singer in the world, Kongar-ol Ondar. It’s really an amazing and moving documentary that you should get on your Netflix queue right away (after checking Lost Weekend first, of course). Well TONIGHT, Saturday January 22nd, Kaleidoscope will host the Genghis Blues Review featuring Kongar-ol Ondar himself in a rare US appearance. Sadly, Paul Pena is no longer with us, but you might just get the next best thing, our own Mission bluesman Seth Augustus, who took care of Paul and learned the art of throat singing directly from him. 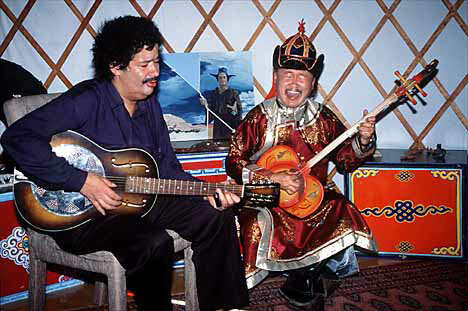 GENGHIS BLUES REVIEW: Rare US appearance by Tuvan throatsinging master, Kongar-ol Ondar, co-star of the Oscar nominated film, Genghis Blues. Also on hand will be cast members Ralph Leighton, Roko Belic, Lemon DeGeorge & Tony DeCicco as well as musical guest Seth Augustus. A night of live music, travel stories, and film excerpts with out-takes from Genghis Blues and never-before-screened footage of Kongar-ol Ondar and Paul Pena performing in Japan. Thank you SO MUCH for cluing me in to this event! My husband just showed me Genghis Blues literally the day before you posted this, and it was SO AWESOME to see this live show. I never would’ve found out about it if not for Mission Mission…even though it was 3 blocks from my home!